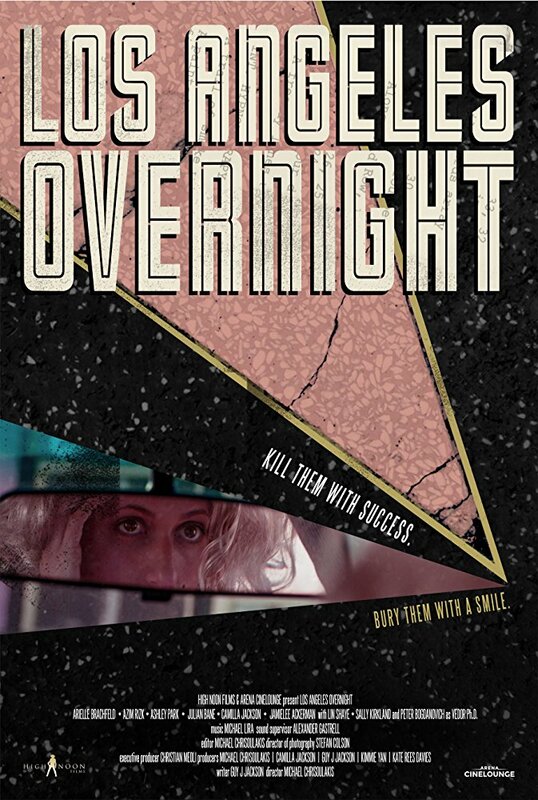 Michael Chrisoulakis’ Los Angeles Overnight is a wonderful independent neo-noir film that explores the seedy underbelly of Los Angeles, and what results when desperation overpowers the life of a struggling actress. Featuring an eclectic cast of characters, a fine performance from lead actress Arielle Brachfeld, a superb score, and some memorable scenes, this is a film that deserves some attention. Priscilla Anders is a struggling actress toiling away at a dead-end waitressing job, unable to land any relevant acting gigs. Her years of failure on the audition circuit and borrowing money from her parents has lead her to the realization that something has to dramatically change, or she’s going to be forced to move back to her hometown. Overhearing a secret code from a trio of seedy diner regulars, she uses her newly realized femme fatale ways and enlists swooning mechanic Benny to assist her in stealing money away from some dangerous criminals. Writer Guy J. Jackson (who also appears in the film as the bad guy “Smalls”) has crafted an interesting story and world that contains a host of eclectic characters and bad guys, all of them weird enough to actually exist in real life. Priscilla’s character is fully developed and the first act slowly displays her struggles and motivations for stepping into a criminal venture. While things seem light-hearted at first, once the deed has been done it sets all of the characters down a dark and blood-soaked path. The directing from Chrisoulakis is spot on. Not only does he get the best out of his actors, but he does an amazing job working with the cinematographer to get some outstanding shots of the city and the various locations that they filmed at. In some ways, the look of the film evoked the style of Terrence Malick, if he were to make an indie noir picture. There are nice close-ups of the actors, great expansive shots of the city during the night and day, and some excellent sweeping overhead drone shots. The score from composer Michael Lira is terrific and is reminiscent of the ‘80s synth style thriller scores from movies like Manhunter, Thief, and To Live and Die in LA. There are certain scenes that rely solely on the score and the visual imagery that is being presented by Chrisoulakis and cinematographer Stefan Colson, leading to some truly memorable scenes. Without potentially spoiling any of the plot, there are several scenes that particularly stood out. One is a foot-chase scene that occurs around various parts of suburban Los Angeles, up long flights of steps and a bridge. It is both darkly comedic and mesmerizing. Another involves a pivotal bar scene with Lin Shaye, which takes place in darkly lit bar with mostly neon red lights inhabiting the room. The cast does a excellent job overall and they are joined by some well known actors in minor roles, which included Lin Shaye, Peter Bogdonavich, and Sally Kirkland. Their roles all serve a purpose, but are really just small guest appearance from these actors. The bulk of the film is devoted to Priscilla, delightfully portrayed by Arielle Brachfeld. She absolutely kills it as this character, both metaphorically and literally. She shows a great deal of range as Priscilla, moving from insecurity and desperation, to a femme fatale and exuding confidence, to the type of fear that would exist as a final girl in a horror film. The other actor that has to be mentioned is writer Guy J. Jackson as Smalls, the low-level thug who ends up becoming a tracksuit version of Anton Chigurth from No Country for Old Men. There are some minor issues with the stunts and effects scenes not looking absolutely perfect, which is to be expected when working on a limited budget and time-frame. These are only minor quibbles for what ends up being an terrific foray into this crazy world of Los Angeles Overnight. 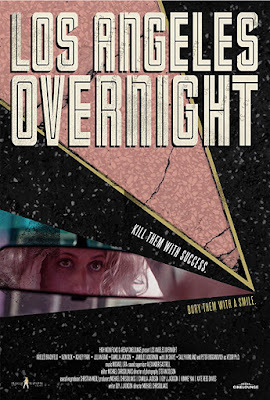 If you’re a fan of film noir or neo-noir, then this is highly recommended. With fine performances from the cast and the eclectic group of characters that they portray, a superb score, and some memorable scenes, this is worth taking a trip down the rabbit hole.